I'm writing a thesis about German linguistic along with my 5 other friends. I need some help for some words and sometimes, I don't really know the differences. "Klettern" means "to climb" and "wandern" means "to hike". These two words have the same common in meaning: doing activities or something like hiking or exploring a mountain. Is there any different meaning besides for hiking or exploring a mountain? Because these two have different meaning in the sentence's context. How do I know that these two words are different even though they sound the same? "Klettern" always means you need to use your hands to go somewhere, "Wandern", even "Bergwandern", usually means to make a hike where you can go without support by your hands. (And please don't take this too literally, surely you need your feet for every "Kletterroute", and sometimes your hands on a "Wanderung", but I think you get the idea). I was not aware that "hiking a mountain" could be seen as interchangeable with "climbing", I thought the distinction was almost the same in english as in german. Are you sure it is not? "Wandern" is mainly walking (note the similarity with "to wander"). You can wander almost anywhere. You can wander on a path near a river, through the streets of a town, and on a trail up a mountain. All you need is shoes (some might not need them), time and a nice view. A Map, bandages for your heels and a drink might also be helpful. The general direction is smooth to steep terrain. But you never "wander" up a wall. Which brings us to climbing. To climb you need an obstacle. You climb on it (mountain, ...), over it (wall, rock, tree, ...). Under it (cavern ceiling, bridge, ...) or through it (hoops, caverns with bad flooring, ...). All you need is shoes (climbing ones prefered), a secure rope to keep you from falling to death, a partner unless you are proficient enough to secure yourself, strong hands, good technique and a definitely no fear of heights. 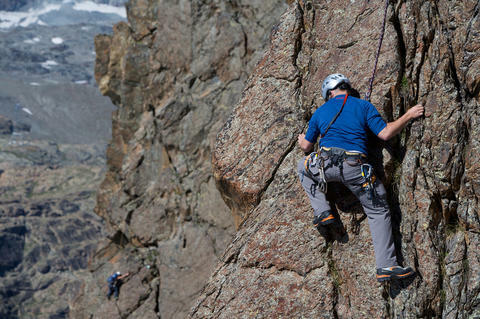 In climbing you usually gain height, while wandering usually gains distance. There is some middle-ground between wandering and climbing, which is labeled hiking. Not the answer you're looking for? Browse other questions tagged meaning differences german-to-english or ask your own question. Is a body of water “die See”, “das Meer” or “der Ozean”? beschränken vs einschränken – is there a difference? What's the meaning of “würde”? What is the difference in usage and meaning between “Laune” and “Stimmung”? When did pathetic and pathetisch divert in meaning? How are “irgendjemand” and “irgendetwas” different from “jemand” and “etwas”?